iGrid T&D team has expertise in the design of hydropower control systems, from pure hardware development up to global control and communication projects. Hydropower Control solution designed by iGrid T&D is open, scalable and highly reliable. 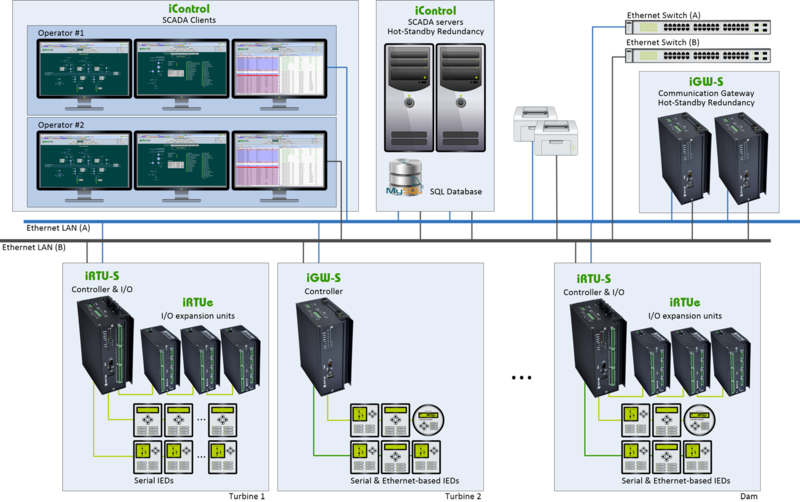 A control system based on iControl SCADA software and iRTU & iGW series products offers a flexible solution suitable for a wide range of installations, from small hydroelectric plants to large power plants. Powerful and reliable communication gateway able to run either in standalone or redundant modes, and equipped with an embedded Ethernet switch. It supports most standard protocols including IEC61850 (Client and Server). Smart and scalable controllers for hydroelectric plants equipped with an embedded Ethernet switch, and I/O capabilities. Support for standard protocols (IEC60870-5-101/104, DNP3.0, IEC61850, etc.). High-performance SCADA with advanced functionalities such as hot-standby redundancy, automatic line coloring, alarms notification (via e-mail and sms), SQL logging, and reports generation.